Considering the UK invented heavy metal, it’s always frustrating to reflect on how ‘seemingly’ unsuccessful we were at thrash metal! Predominantly an American phenomenon, UK thrash always rode the coattails of our Transatlantic cousins when, in retrospect, British thrash bands actually had much to offer. Largely forgotten over the years, it’s time to re-address the balance and take a look 10 old-school British thrash albums that put the ‘Great’ back into Britain again! No ranking, we’ve gone for alphabetical order. Every one of these albums is a blinder! 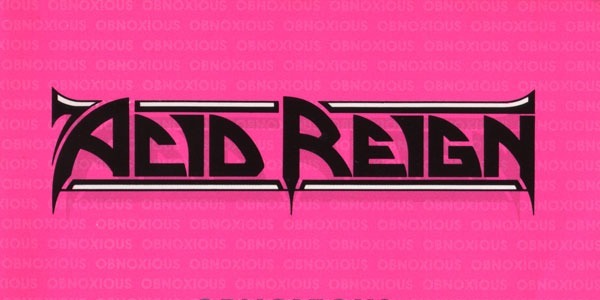 A British band known for embracing the sillier side of thrash, Acid Reign actually reigned in the lunacy on second album Obnoxious and the result was an album that embraced a previously untapped progressive edge and proved, once and for all, that us Brits had what it taook to step up to the next level. Slowing down, slightly, ‘H’ and co. adopted a more focused attitude on Obnoxious, imbuing their intricate riffs and biting lyrics with a keener eye for detail and the results were impressive to say the least.“Thoughtful Sleep” remains a highlight; a technical excursion into a story of child neglect which surprises with its schizophrenic time changes and multiple personalities. Intelligent, complex and highly original, in an ideal world this song alone would have elevated Acid Reign into the big leagues. As it turned out, they were unjustly overlooked and imploded shortly after Obnoxious‘ release. A relatively recent reappraisal of Acid Reign’s contribution to thrash finally resulted in an eagerly awaited return (albeit without 4 of the members who penned Obnoxious) and the band released ‘The Apple Core Archives’ in 2014 – a box set retrospective that was an absolutely essential purchase for anyone with even a passing interest in thrash. Two brand new singles followed in the formidable shape of “Plan Of The Damned” (2015) and “The Man Who Became Himself” (2017) with a new album imminent. All is looking rosy! Liked that? Try this: The new singles! Both “Plan Of The Damned” and “The Man Who Became Himself” proved there’s plenty of bite left in this apple-core brigade and bode very well for AR’s long-awaited new album!